Maria Sharapova's dream of completing her career Grand Slam is just a day away when she plays against Italian Sara Errani in the women single's final of Roland Garros on Saturday, 9 June 2012. Sharapova defeated Petra Kvitova 6-3, 6-3 in the Roland Garros semifinal. She now needs a victory over 21st-seeded Sara Errani, who beat No. 6 Australian Samantha Stosur 7-5, 1-6, 6-3, to become the 10th woman to win all four major tournaments. Sharapova has never played Errani before and this will be her unique experience meeting someone she has not played before in a Grand Slam final. Sharapova, however, is in her best form for having won all of her last eleven matches played. Now the clash of femlae titans on Saturday would be worth watching: Sharapova aspiring to complete her career Grand Slam and become the 10th woman to win all four major tournaments, and Errani for wininng her first Grand Slam title. 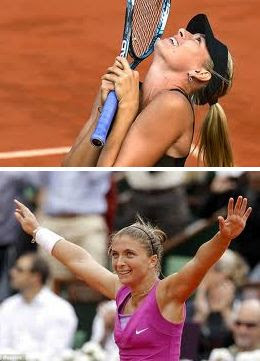 Let us not forget to watch the Roland Garros women single's final and see whose dream comes true at Paris. The match is scheduled for Saturday, 9 June 2012 on Court Philippe Chatrier at 13:00 GMT.